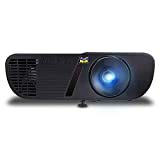 This is a great affordable Digital Light Processing (DLP) projector with 3,200 lumens which offers bright, vivid, and realistic images. The images are as color saturated and as sharp as on your laptop, monitor, or tablet since it’s made with Texas Instruments DLP for the best in class light, optimal balance of color, and color accuracy with five different view modes ranging from Bright to Movie mode for different usage purposes. ViewSonic PJD5155 SVGA DLP Projector is a perfect choice for those looking for an affordable, multi-purpose projector that is ideal for small to medium rooms at businesses and schools that are on a budget yet want the best projector for their money, since this model offers amazing combination of features, performance, and affordability. This model weights 4.8 pounds, and its measurements are 9 x 12.4 x 4.1 inches, so it is compact in size, lightweight and portable. It boasts a new modern, and sleek, as well as user friendly curved design. You have white and black options for this projector, as well as an easy-access intuitive interface boasting a tactile keypad that has raised concave buttons as well as a central reference button. For really decent sound quality, this projector comes with Sonic Expert, enlarged powerful speakers and enhanced sound system, as well as a proper amplifier for amazing immersive audio to fill the classroom or meeting room wall-to-wall. Great connectivity options on ViewSonic PJD5155 SVGA DLP Projector include a VGA output, a mini USB, RS232, Audio in and out, Composite Video and S-Video, 2 x VGA, and the latest HDMI input that lets you view 3D picture directly from your 3D Blu-Ray players, as well as to connect to laptops, tablets, media players, or desktops. Lamp life on the ViewSonic PJD5155 SVGA DLP Projector is extended to nearly 10,000 hours with the function called DynamicEco (from 6,000 in Eco modes and 5,000 in Normal). This decreases energy usage by approximately 70% in order to help reduce the overall cost of ownership. When the projector is not in use, DynamicEco is automatically activated, and can also be managed with the remote through the DynamicEco button.